Dishwashers are among the most commonly used electronic appliances in homes, hotels, restaurants and eateries. This is also why dishwasher repair services are the most sought after repair services. Dishwashers, if operated with basic concern for their nature, will endure for many years without complaints. Their nature is that you can't expect them to gorge on heavy leavings of food and operate flawlessly. They have only a limited appetite for food. Their grinding mechanism is small and easily overcome by particles of bones, glass, and other debris. You will understand that paper clips, rubber bands, and other accidental refuse will be even less digestible. Though some manufacturers claim their machines have heavy scrubbing talents, tempting you to throw in a pot loaded with burned cheese, beans, and other debris, the facts are against such rhetoric and overly optimistic behavior. If continued, a dishwasher repair technician may need to be called. The motor below the washing cavity, is well protected from the destructive water above it, but not entirely so. A gasket, plus an auxiliary cover keeps the water out. But the gasket can wear out, ruining the motor. If you catch the first sign of a leak, you can prevent this from further damage and a more costly dishwasher repair. The first leak, however, isn't likely to be the gasket above the motor, but rather the more commonplace gasket that you see every time you do the dishes. That's the lid gasket, which needs replacement about every five years or less. This gasket is easily replaced. It simply pulls out of its channel. Sometimes it leaks because corrosion builds up on it. The cure is to scrape it off. However, the usual trouble is that something gets caught in the grinding mechanism below the impeller or drain pump inlet, at the bottom of the cavity. Water won't drain out property. The mechanism clogs and the motor itself may refuse to turn. If it is inadequately protected, it can burn out. This dire situation isn't likely to be caused by food particles, but rather by foreign material such as a rubber band. Such "foreign material'' is all too common, since rubber bands are common kitchen currency. To get at this problem requires that you remove everything above the bottom area. This operation will vary with the type of machine. You could always consult an appliance repair company, who has the requisite knowledge for dishwasher repairs. If you feel that you need to have someone repair your dishwasher, call us at 872-9956 or submit your request on the Contact page and we will have a dishwasher repairman contact you promptly to assist you with your problem. Our customers are our greatest asset and your recommendation to your friends is you’re your greatest compliment to us. 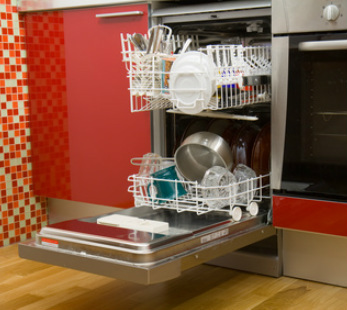 We are more than happy to answer any questions about dishwasher repairs that you might have. A dishwasher is generally a low maintenance appliance. Below are some tips for keeping it clean and running well. If the plastic coating wears off of the tines of the dish racks in your dishwasher, they may corrode and rust. Promptly repair cut or chipped plastic coating on racks to prevent rust. Use steel wool to remove rust and cap the damaged rack tines with slip-on rubber tips. You can get a rack- or tine-repair kit from the manufacturer. If your dishwasher won't drain, clean the filter at the bottom and try running it over again. If this doesn't work call a qualified repair expert. My dishwasher is not getting dishes clean. Try taking some of the dishes out. On some machines it is important not to cover the "power tower cleaner" located in the center of the dishwasher. If you put too many pots and pans on the bottom rack the water won't be able to get to the dishes on the top rack. Be sure the door is latched securely. Be sure the water is turned on. Check that the dial pad is properly selected for a cycle. Allow time for select models to drain/pause before filling. Check the home's circuit breaker or fuse box. Check the inlet hose for a kink. Check the water valve inlet for sediment and clean if necessary. Won't Drain Water in Tub Bottom. If hooked up to a garbage disposer, be sure the knockout is removed from the disposer inlet. Be sure the drain hose is elevated in the drain or disposer. Check drain hose for a kink. Check your home's circuit breaker or fuse box. Check that the cycle is completed. Be sure dispenser is not blocked. Use fresh detergent which has been stored in a cool, dry place. A water valve hiss during fill is normal. Water circulation sounds are normal. A ticking noise is a normal timer sound (certain models). A thumping sound may be a wash arm bumping an item that is extending beyond the racks. Chopping or grinding sounds may be heard during draining as the internal food disposer chops hard times like fruit seeds, nuts, etc. Humming during drain is normal. A snap noise is the detergent cup lid hitting the door liner when the dishwasher door is opened at the end of the cycle. This is normal. Proper installation affects the noise level. Check that the dishwasher is level. (Refer to the Installation Instructions). Suds can cause the dishwasher to overflow. Measure the detergent carefully and use only detergents designed for use in a dishwasher. Less detergent is needed in soft water. Try another brand if sudsing continues. Occasionally moisture droplets may be noticed on the door vent in the area where the droplets have evaporated they may fall to the floor. Food Soil Remains On Dishes. Run hot water at the sink before starting the dishwasher. Use fresh detergent stored in a cool dry place. Select proper cycle for the soil level. Load the utensil basket with some handles up and some down to prevent nesting. Do not place glasses over tines. Items Washed in the Dishwasher or the Dishwasher Tub Itself are Stained / Discolored. Aluminum utensils or pans can leave marks when they rub against other items. Leave a slight space between items. Iron in the water can leave a yellow, brown or orange film on dishes or the dishwasher tub. A filter may be needed. Rust remover can be used to remove rust. Color from tomato sauces may adhere to the tub. If light staining has occurred, leave the door open to oxidize the stain away. For removal of heavier stains, try a dishwasher cleaning product that contains citric acid. Changing to a lemon-scented detergent may also help. Items Not Properly Dried / Moisture is Present on the Dishwasher Interior After the Dry Cycle. Be sure Heated Dry is selected. Water droplets may be from on the inner door as part of the drying process. Use a rinse aid regularly, to improve drying. On models equipped with an adjustable rinse air cap, turn the cap towards the MORE setting. Select appropriate water-heating option (i.e. Temp Sense, Sani Temp, Sani Clean, etc.). Increase detergent amount to match water hardness. Plastic and Teflon items are inherently difficult to dry because they have a porous surface and tend to collect water droplets. Towel drying may be necessary. A Quick/Rinse cycle does not dry the dishes. Towel drying is required. 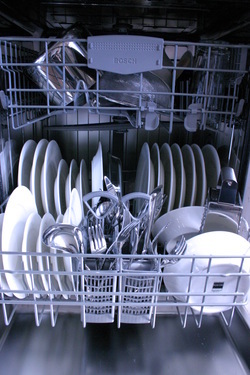 A dishwasher combines water with detergent, heats the mixture and sprays it against the dishes. It pumps out the dirty water and then rinses the dishes with clean water mixed with a rinse agent. After pumping out the rinse water, the dishes are dried by either heating or air drying them. The selector switch allows you to pick a variety of cycles which vary the length of wash, water temperature and drying temperature. When the door latch is closed, the door switch is engaged and allows the dishwasher to operate. Based upon the chosen cycle, the selector switch signals the various components to operate at the appropriate stage of the cycle. The timer regulates the length of each stage of a cycle. The water inlet valve fills the tub with water. A float in the tub prevents the dishwasher from overfilling. Either the float or the timer signals the inlet valve to close. The detergent is then released into the tub. In many dishwashers the mixture is heated with an electric heating element. Water that is not warm enough results in poor cleansing. The motor turns a pump which forces the water up through the spray arms and spray tower (if any). The pressure of the water causes the arms to turn. Some dishwashers have a two-way motor. When it turns in one direction, it pumps the water through the spray arms. When it turns the other way, it pumps the water out through the drain. If the motor only turns in one direction, then an actuator moves to channel the water either to the spray arms or to the drain. After the detergent cycle is complete the dishes are rinsed. If the dishwasher has a rinse agent feature, the rinse agent is added to the rinse water. Once the rinse cycle has completed and the water has been pumped out, the dishes are dried. An electric heating element heats the interior of the dishwasher. Some dishwashers also have a fan to circulate the air. A thermostat prevents the dishwasher from overheating. Some dishwashers employ soil sensors to monitor the clarity of the wash water. When the water becomes clear, the sensor signals the control timer to advance to the next cycle.